The Canton Repository Grand Parade was held on Saturday, Aug. 6 beginning at 8 a.m. The first grand parade was held in 1963, and it has become one of the largest of the events celebrating the induction of the newest Class of Enshrinees into the Pro Football Hall of Fame. 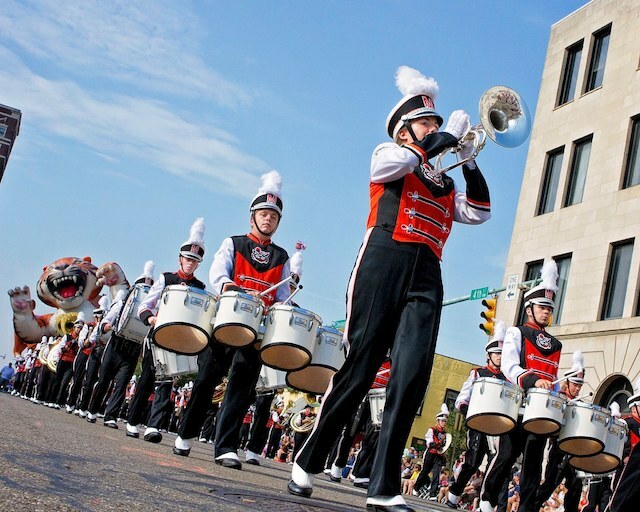 The Canton Repository Grand Parade will enjoy a wide television viewing audience on Fox Sports Ohio, on Sunday, August 14 approximately 5:30 to 7:30 p.m. (immediately following the Cincinnati Reds game) with a re-air scheduled for Monday, August 22 from 7:00 to 9:00 p.m. Fox Sports Ohio is available to almost six million households saturating Ohio and reaching into portions of West Virginia, Kentucky, Illinois, Indiana, Pennsylvania and New York. For more information, call Erin Adcock at (330) 458-2053, or visit the Enshrinement Festival Web site at www.profootballhofef.com.